Supermarket giant Carrefour has installed 600 Bluetooth Low Energy (BLE) beacons in its 28 hypermarkets in Romania to guide shoppers around the stores and to deliver personalised promotions and offers either directly to their smartphones or to Samsung tablets affixed to the handles of their shopping carts. The platform used by Carrefour is provided by beacon technology specialist Onyx Beacon which has also installed five hundred beacons across buses and trolleybuses on public transportation lines in the city of Bucharest to guide visually impaired passengers. “At the entrance in the supermarket, a few special shopping carts are waiting for the customer,” Onyx Beacon explains. 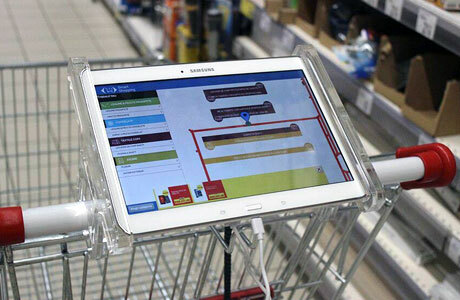 “Last generation tablets produced by Samsung are installed on the shopping carts handles. A large sticker placed on the floor invites the visitor to use the Smart Shopping mobile application which can be downloaded and used on any smartphone, if the BLE port is opened. “The user’s steps are simple; select from a predefined list of store departments where you want to go in this shopping session. You note in the comments field of each chosen department the names or product categories that you have on your shopping list. After completing the shopping list and inventory of aisles where you want to go, the application calculates the route and shows you a path to follow on the store map. “As you advance from one area to another, the route is updated and the tablet on the shopping cart or your mobile phone shows your next directions. At each aisle of the hypermarket where you shop, you’ll get two, three or four notifications displayed as overlapping mini-windows. These are the active promotions at the time and at the place where you are at that very moment. Carrefour has 178 stores in Romania, including 28 hypermarkets, 97 supermarkets and 53 convenience stores. The France-based retailer has been trialling NFC in its stores since 2009 and recently opened a new hypermarket in Villeneuve-la-Garenne equipped with 55,000 NFC shelf-edge labels. It is also testing an LED in-store lighting system in its Lille hypermarket to send location-based services, offers and promotions to a shopper’s smartphone and piloted BLE beacons attached to trolleys and baskets in Spain last year.